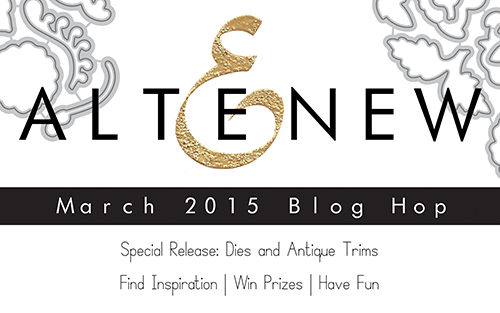 Altenew Special Release Blog Hop + Giveaway! Now Closed. Thank you everyone! Hello everyone! I’m so very excited to be joining Altenew for the special release blog hop! Yes, you guessed it right – Altenew now not only sells stamps but also dies that coordinate perfectly! Want to see them in action? Scroll down to see my project and hop along our design team blogs to find more inspiration. One more product that will definitely catch your attention – the new Antique Trims. Head over to the Altenew blog to find out more about it. Here’s a look at my card. I wanted to create a bright and contrasting project, so I used black cardstock for my card base. I stamped and colored the branches and flowers from the Doodle Blooms set using greens and aqua colors and cut them out using matching dies. 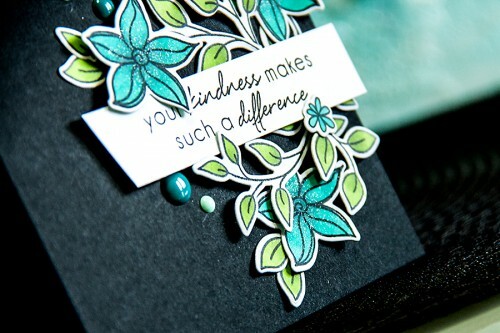 For my sentiment I used the beautiful “Your kindness makes such a difference” one from the Sentiments and Quotes set. 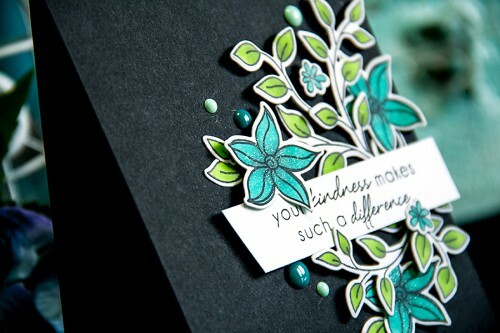 To give this project a bit of sparkle I used my Wink Of Stella glitter pen and added a touch of glitter to the flowers. I also scattered a few enamel dots around that floral cluster and that finished my project! Melania Deasy – next stop! To celebrate this release, Altenew will draw three winners who will each receive a $30 gift certificate to their online store. Please leave a comment on the Altenew blog by Friday, March 20 11:59pm EST for a chance to win. The winners will be announced on Saturday, March 21. I also have one $30 certificate to give away to a lucky reader! To be eligible to win leave a comment here by Friday, March 20 11:59pm EET for a chance to win. The winner will be announced in this blog post and also posted on the sidebar. Good luck! Thank you everyone for your lovely comments! I wish I had the time to reply to each and every one of you and thank you personally. Very pretty. Love how the vines curve over the sentiment. Mary, I will be sending you an e-mail with instructions how you can claim your prize. Seriously fun card, just love the bright colors! Love the colours on your card, very stunning. The flower stamps and dies are wonderful. Beautiful card! I love the blue/green with the black card base. Stunning! Beautiful color combo & so striking against the black! Charming card , your favorite color combination is very interesting , and if I were the knives and stamps , I would have turned out so beautifully )) ? Oh I just love the way this pops on the black! Stunning! This release is killing me! I am in love with everything I see!!! I have a full wish list!!! Great colors against the dark background. Beautiful card! Love the colors and sparkle! What a lovely card. Love the contrast of the flowers against the black background. Awesome!!! Love the dark background!!! Fun contrast with the colorful flowers! So striking against that dark background! Gorgeous card! Beautiful flowers and lovely coloring! I love the blue and green together against the black, really makes those pretty flowers pop! Your cards are always amazing Yana! Love the Wink of Stella you added to the pretty flowers! Very very stylish card. Excellent combinations of colors. Yana you a amazing! Beautiful color combinations.. love all your cards.. thanks for the chance to win the altenew gift card! I love when a card looks both colorful and animated! Looks like you free hand it with a doodle style. Simply put Beauitful!! These look amazing against the black. So dramatic and beautiful!!! The colors are so bright and beautiful. Wonderful job well done. Black paired with bright pastels, oh yeah! Love this! This is stunning. The colors against the black are just gorgeous. I don’t have that set, but now I want it. Your card is gorgeous! Wow! I love cards with a black background. This one is beautiful! Wow! So dramatic and stunning! Now I’ll have to save up for the dies and this stamp set! I love the colors you chose against the blak cardstock! Very nice! The colors of the flowers are really popping out against the background! Very cool! Листівка суперова! З задоволенням поприймаю участь в такому блогхопі! 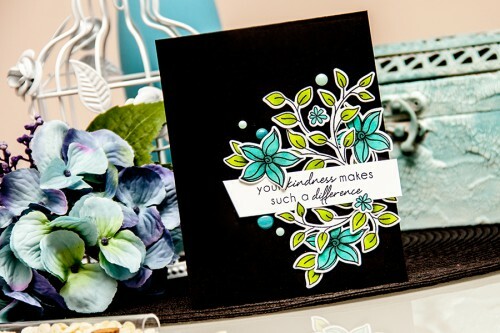 Beautiful cards… Amazing color combos… You use the Altenew stamps so creatively.. Thanks for the chance to win the Altenew Gift card! Gorgeous flowers on the dark card stock. Just beautiful! So beautiful! Those colors really pop! These colors are AMAZING!!! Great layout, and LOVE that touch of glitter and enamel dots! This is such a unique and beautiful card. Such a piece of artwork should be framed! Absolutely beautiful card, the colors are just gorgeous! Your cards are always gorgeous. I love your style. A beautiful card, Yana! The beautiful bright colours really ‘pop’ on the black background! Thanks so much for sharing!